The services that FerWay can provide are illustrated by means of practical ATM System questions and paths for solution that FerWay services will employ. Most importantly, the questions illustrate the types of challenges in which FerWay can support your organization. Feel free to contact FerWay for your specific ATM Developments and their innovations. In this section, some examples of questions that may arise in the development of Arrival Management discipline are given. FerWay has extensive experience in the field of AMAN design, development and validation. Check our Projects section for an illustration of these activities. Scenario 1: Low to medium density arrival operation, with less than optimum fuel and/or noise performance. Scenario 2: Low to medium density arrival operation evolving into high-density operations. Question: Improving an existing AMAN supported operation. We need to enhance the performance of our AMAN process to improve ATC as well as flight efficiency. For example: We have many hours of high density arrivals often characterized by very long downwind patterns. Do we need to modify the AMAN system, change procedures and/or operational practices? How do we implement these changes? Analysis of current and targeted operational situation (see Working Method). The current performance is measured (see "Measuring the operational performance of the AMAN supported process" above). Based on the requirements of the target situation, a design activity is performed, analyzing different implementation strategies involving technical, procedural or operational modifications tailored to the possibilities of your organization. For example, an enhancement to your AMAN tool be a solution, like the improvement of the Trajectory Predictor accuracy, but perhaps modifying operating practices may achieve a similar end result. Depending the design solution chosen, requirements, procedures, airspace or operating practices changes are defined. This may be accompanied by specific controller training. Question: Defining the Operational performance of the AMAN supported process. What should the operational performance requirements like traffic delivery accuracy of our AMAN supported process be? Analysis of required Operational Concept situation (see Working Method). 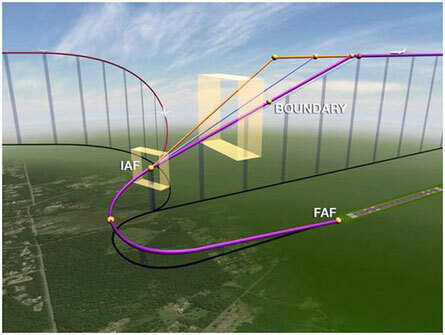 Based on the targets for capacity, environmental constraints, airspace design and ATC sectorization, the required metering target(s) and their margins are derived. This may require balancing sometimes contradicting requirements. If desired, requirements for AMAN tools, operational procedures and practices can established or adapted. Question: Measuring the operational performance of the AMAN supported process. How do we establish the operational performance of our current AMAN supported process? How can we extend our AMAN range to have the arrival operation become more effective? Intra and inter center coordination procedures. From the analysis different options are designed to modify elements of the ATM System. For example: creation of inter-centre cooperation operations to implement delay sharing. All changes to systems, procedures and operating practices are detailed and requirements established. An evaluation is performed of the freeze horizon of the AMAN tool in use or to be deployed. A careful analysis of sequencing and metering characteristics under different freeze horizons is performed using real life traffic samples. The results of this simulation activity are used to make a well-informed decision where the freeze horizon(s) should be defined as well as the optimum delay sharing techniques and parameters, balancing all the factors affected by this choice. Question: Should we install an AMAN at our facility? We do not currently use an AMAN at our facility. What will be the benefits for our facility if we install an AMAN? Analysis of current operational situation (see Working Method). The effects of introduction of an AMAN supported operation will be analyzed.